Microsoft has announced the newest version of Windows. Today, the company is allowing adventurous users (like yourself) to try it out for free. Here’s how. Microsoft gave us a small peek at the next version of Windows today, confusingly dubbed Windows 10. Back up your data first! Not that you had any excuse not to anyway, but be sure to perform a backup on your data before you upgrade if you have anything you can’t recover. Or even if you don’t. Just do a backup. You won’t be able to use your recovery partition to downgrade. If you have a recovery partition on your system, it will no longer be able to restore your computer to the version of Windows you had before. You’ll need external recovery media to undo the upgrade. As you might expect since you don’t have a recovery partition, you’ll need a disc or USB drive with Windows 8 (or older) on it to get back to the way things were if you don’t like or can’t use Windows 10. As Microsoft mentions multiple times, this is pre-release software and is expected to be very buggy and probably crash-prone. Furthermore, they can collect a lot of data —including text you type or the kinds of files you open—to improve the product. It’s not advisable that you install this on your work machine or anything you need daily or sensitive use out of. 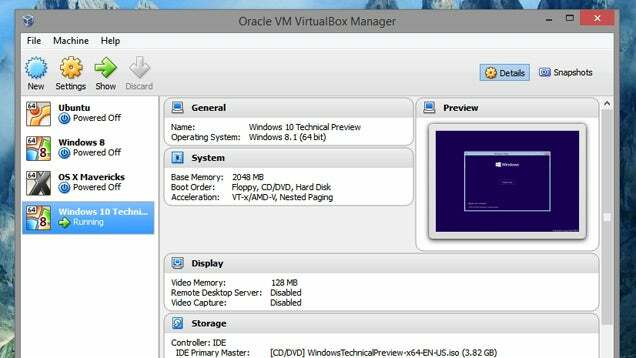 We’ll show you how to install it on a spare PC, or—if you don’t have one—in VirtualBox. 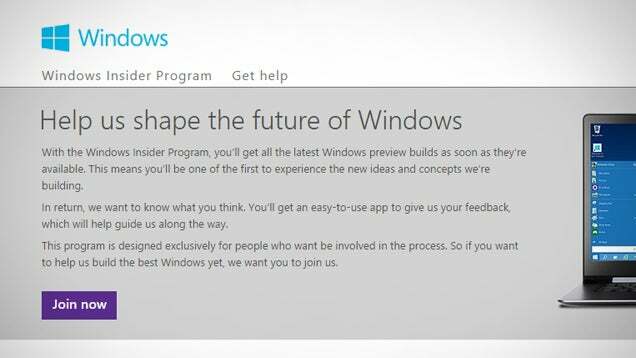 This time around, Microsoft has created the Windows Insider Program to allow users to test out the new hotness. You’ll need to agree to a special terms and condition, which likely mostly consists of “don’t blame us if this breaks your stuff” in addition to the usual jargon. In addition to downloading the update, the Insider Program will be how you provide feedback and get help from the community. A DVD or USB drive large enough to hold a 4GB ISO file. A spare computer to install it on (Microsoft does not recommend using your daily driver), or VirtualBox installed on your main machine. As soon as you’re enrolled in the Insider Program, you’ll be directed to download one of several ISO files. Currently, there are four languages supported (English, English UK, Chinese Simplified, and Portugese Brazil), in both 32- and 64-bit configurations. Grab the version that matches your needs and let the download do its thing. Though you may want to grab a snack, as the downloads range from 3-4GB, depending. Copy the ISO to a disk or USB drive. You can use a tool like ImgBurn to unzip the contents, though if you’re installing on a device that’s already running Windows, the OS should be able to mount the ISO itself. Insert the disk or USB drive in the computer that you want to install Windows 10 on. If you have an older copy of Windows installed on that machine, start it up and double-click setup.exe from the installation media. If not, you can boot up your PC from the installation disc to start installation. 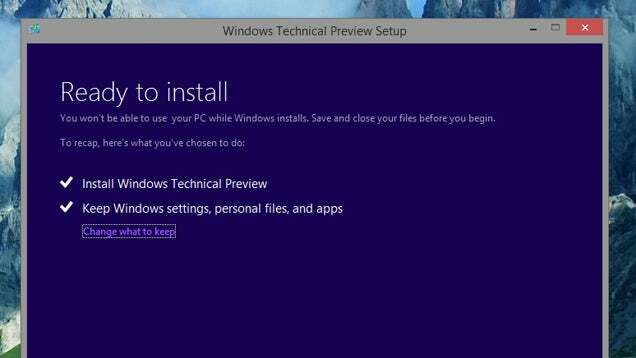 Microsoft’s wizard will walk you through the rest of the installation process. If you want to do a clean install, make sure you choose to “Keep Nothing” during the wizard. If you don’t have a spare machine to try out the Technical Preview, we recommend installing it in VirtualBox. That way, you can try it out, see what’s new, and play around without overwriting your main system. Download and install the latest version of VirtualBox, and star t it up. Head to Storage in the left sidebar, and next to “Controller: IDE”, click the Add CD button. 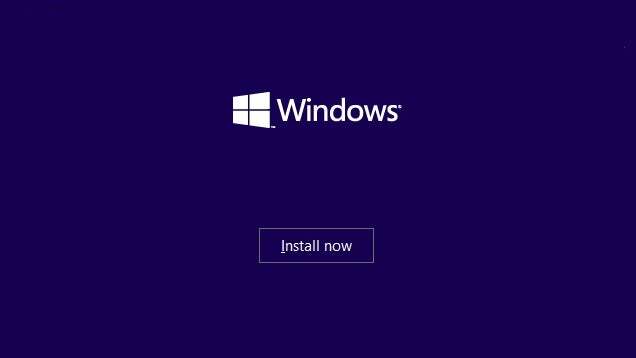 Press Start to start up your new virtual machine and go through the Windows 10 installation process. To improve your VirtualBox experience, click here for tweaks and tips that’ll speed up your system. VirtualBox is great for testing out a new operating system. Remember, this is pre-release software, so install at your own risk! If you aren’t interested in risking your machine, we’ll be poring over the new OS to let you know what other cool stuff Windows 10 has in store over the next couple days. Good luck! These days malicious software is becoming an epidemic. It seems like it’s everywhere. Also, there’s been a change in the way Malware / Virus acts. It used to be that it would slow down your computer, or display annoying popups, but now malware is becoming increasingly discreet. You could be infected right now ,and not even know it. Also, it often seems as if the only way to make sure you’re not infected is to scan your computer with numerous anti-malware programs. Doing this can be time consuming and, while scanning, may even slow your computer to a crawl. Even after that you still can’t be sure you’re clean. This is because scanners cannot recognize all new malware. Because of these difficulties I have come up with a better method. This uses multiple programs, not to remove files, but just to analyze the computer. Each of these programs is very effective and easy to use. They are all portable applications and will not cause any conflicts on your computer because they are only running when you’re using them. However, they do require an active internet connection to function properly. Don’t worry, these steps will also help you to fix your internet connection in the event that it is not working. After you have already gone through the below process once, and had all files whitelisted, this approach is much faster, much more certain, and much easier than any other approach I’ve seen. No active malware / virus can escape this process. However, inactive pieces of malware may not be flagged by this approach but may be found by other scanners. Rest assured that these are not direct threats to the safety of your computer and thus do not constitute a failure of this article. These are some of the scanners I run while a repairing an infected computer. Even after a Virus infected computer has been removed from a system many of the problems caused by it may still remain. That said, one of the first things you should do in order to fix any of these problems is to make sure that all infections have actually been removed. Read my article to find out What Is Malware. If you know that you still have infections on your computer then, instead of trying to fix problems while the virus infection still present, you should first remove all virus/malware infections. To do this please see my article about How to Repair your Computer before seeking IT Support. Finally, Stop thinking that a free antivirus will safe you in today’s Virus World, that will never happened. If you want to be safe from Trojans, spend the money on a a real antivirus I recommend Malwarebytes Premium . 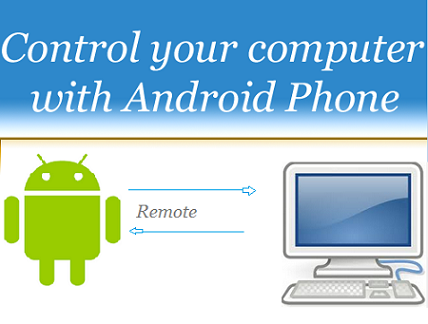 Now you can remote control your Computer with Android Phone. Its a great feature in android phone that you can take remote desktop of your PC from any where. There is Chrome Remote Desktop is the best App for the Android and PC for access computer on your android phone. You can share file and folders and Run and stop music also you can restart and shutdown computer through your android phone. 1. First of all you will have to install Chrome Remote Desktop Apps on your computer which your want to Access. Click here to Download. To Open Google Chrome and then Click on wrench menu and then Click on Settings. Now on the Left pane Click on Extensions and then Click on Get More Extensions. Now on the Chrome web store windows type Chrome Remote Desktop Apps on the search Box and press Enter. 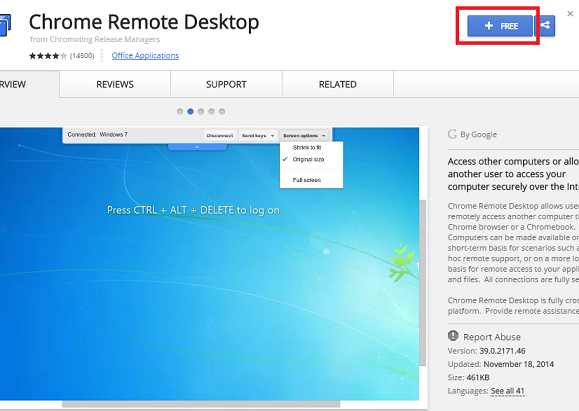 then you will find Chrome Remote desktop Extension and then Click on + Free to download and then Click on Add button. 2. Now Click on Launch it and then it will ask for Authorization and then Signing in your Google account and then Click on Continue. 3. Now Chrome remote Desktop ask for permission to access your Computer , Now Click on Accept. For better viewing on Remote control devices, you may want to use an Android tablets, it works perfect for me in my line of work. Malware is one of the most dangerous threats that people should always try to eliminate in their computers/laptops especially while using the internet. It can destroy /corrupt computer systems in an instant when not prevented or eliminated immediately. Cyber criminals can use malware as a tool in the process of monitoring the online activity of their targets while using the power of internet. All the dangers that malwares can create in the daily living of internet users are not limited to that extent. This is because malwares can be used also to steal the personal information of an internet user without spending a lot of effort. Make sure automatic updates is turned on to get all the latest security updates. Don’t open email messages as spam or click links on suspicious websites. Warning: Cybercriminals sometimes try to trick you into downloading rogue (fake) security software that claims to protect you against malware. This rogue security software might ask you to pay for a fake product, install malware on your computer, or steal your personal information. Don’t click links in email messages and avoid websites that offer free software—especially free antivirus software. For more information, see Watch out for fake virus Alerts. Check Computer Status – there’s a possibility that a personal computer has been infected by malware if its excellent performance changed negatively in an instant for an unknown reason. One of the negative effects of malware in the performance of a person computer is poor power-efficiency. A personal computer that has been infected by malicious software loses more power while functioning. Install anti malware software and update it regularly – security software is always important in the process of protecting a computer from the negative effects of malware. It provides extensive protection against viruses, malware and spyware that can make the daily living of a person miserable when not eliminated instantly. Don’t download anything from suspicious website – free downloadable software, games and applications usually contain malware. Such reality is very common in all products that suspicious websites can offer. Ignore pop-ups – pop-ups usually contain download links where malware can be extracted instantly. Update the Anti malware Software – a security tool is very useful when it comes to the process of minimizing and eliminating the negative effects of malware in a person computer. Reformat the Computer that has been infected (Optional) – it is necessary to execute this step if the condition of the infected computer is already at the worst level. Restore all Programs and Files – a backup file can help a person restore all files in a personal computer in a very excellent way just in case the malware that has been detected in its system is no longer available. The difference between a GUI and a CLI is that GUI refers to Graphical User Interface while CLI refers to Command Line Interface. GUI is a type of user interface that allows users to interact with electronic devices with images rather than text commands. CLI is a mechanism for interacting with a computer operating system or software by typing commands to perform specific tasks. features are used when readying a switch for integration into a live network environment. Realtors Can Now View MLS on Mac. Here’s How!!! As an IT consultant I come across many Realtor companies, tired of their windows PC, and looking forward a Mac upgrade. The only problem I hear all the time is that they cannot access their MLX MLS on Mac, because it’s only compatible to Internet Explorer. For many years I’ve being able to help realtors run their MLS on Macs. here’s a quick way in which they can do it. 1. You must first go to download Fusion <— CLICK HERE –> download and install the software. VMware Fusion has a feature called Easy Install, which makes it faster to install Windows in virtual machines. This article provides the steps to create a new Windows virtual machine using the Easy Install method. Installation instructions if you are not using Easy Install can be found in the Guest Operating System Installation Guide. If you would like to make your existing physical PC into a virtual machine, you can use Migration Assistant (Fusion 3.x and later only). For information, see Best practices for using and troubleshooting Migration Assistant (1017993). Before creating a virtual machine, and run MLS on Mac you must obtain the operating system and any necessary product keys for installation in that virtual machine. VMware Fusion does not come with any operating systems to install in virtual machines you create. This method assumes that you are using a physical CD or a disk image (.iso / .cdr /.dmg file). You cannot create a Windows virtual machine by using .exe files downloaded from Microsoft, as those files need to be run on a Windows PC. If you downloaded a.exe file from Microsoft, log in to your order page, locate the alternate download link, and select one of the two .ISO file formats, either 32-bit or 64-bit. In Fusion, go to File >New. The New Virtual Machine Assistant launches. If you have a physical CD/DVD of Windows, proceed to step 3. Click Use another disc or disc image. Select the ISO you downloaded, then click Open. Click Use operating system installation disc image.. Follow the on-screen prompts to choose the operating system type that matches your installation media, appropriate license . For more information, see Creating a Virtual Machine Using Windows Easy Install in Getting Started with Fusion. Click Finish to begin the Windows installation process. Let the Windows installer to complete as it would on a physical System. Finally, what realtors have been waiting for!!! MLS on Mac. 1. Go to this Website http://www.tinyurl.com/sefmls. 2. Wait for the page to load, and MLS Login page will appear. 3. If you cannot see the Login ID or Password fields, look towards the bottom of the page. and click where it says click here to get flash. http://www.sunshineonsite.com for future FREE technical advise. System Restore helps you restore your computer’s system files to an earlier point in time. It is a way to undo system changes to your computer without affecting your personal files, such as documents, or photos. Sometimes, the installation of a program or a driver can cause an unexpected change to your computer or cause Windows to behave unpredictably. Usually , uninstalling the program or driver corrects the problem. If this does not fix the problem, you can try restoring your computer’s system to an earlier date when everything worked correctly. System Restore uses a feature called System Protection to regularly create and save restore points on your computer. These restore points contain information about registry settings and other system information that Windows uses. You can also create restore points manually. Open System Restore by clicking the Start button , clicking All Programs, clicking Accessories, clicking System Tools, and then clicking System Restore.‌ If you are prompted for an administrator password or confirmation, type the password or provide confirmation. System Configuration is an advanced tool that can help identify problems that might prevent Windows from starting correctly. If you identify a program that is causing problems, you can check for updates or uninstall the program. Using the Selective Startup option, you can turn services and startup programs on or off individually to see if the problem occurs the next time you restart your computer. If you select a check box, the service or startup program will run when you restart Windows. If the check box is cleared, the service or startup program will not run when you restart the computer. Follow this procedure to use the process of elimination to identify the problem. Open System Configuration by clicking the Start button , clicking Control Panel, clicking System and Maintenance, clicking Administrative Tools, and then double-clicking System Configuration.‌ If you are prompted for an administrator password or confirmation, type the password or provide confirmation. Click the General tab, click Selective startup, and then clear the Load system services and the Load startup itemscheck boxes. (on-demand scanning) Allowing users to launch security tool scans for malware on a computer as desired. A whole bundle of problems are caused by viruses and spyware, from slow performance to unexplained errors. I always recommend that you should keep your anti-virus and anti-spyware tools right up to date, but you might want to run an on-demand scanner as well to get another opinion — Malwarebytes Premium and Microsoft own safety scanner are two good choices that won’t interfere with your existing security tools. It turns out MIcrosoft does know a thing or two about their own systems — it offers an automated fix it tool, which will try and detect what’s going wrong and then do something about it. Issues with the display can be caused by the graphics card , the monitor itself or the connecting cable (if you’re not using a laptop). Using a spare cable (if available) or switching to on-board graphics (again, if available) can help you work out exactly which link in the chain is the one going wrong. If your monitor is found to be faulty, there’s not much you can do except dig out the warranty or pay a visit to the local repair shop. Many applications will create caches of temporary files that can occasionally interfere with program behavior — look for an option that will wipe these files. CCleaner is a handy third-party freeware utility that cleans up temporary files for many different applications. This is an awesome free app, that I used all the time for computer Tune ups Don’t look for IT support if you can do it yourself. To create a Google Plus page, you must first have a personal profile. 1. From your profile you can click “Pages” in the left-hand menu. 2. The second step involves choosing a category that defines your business. If you’re a location-based business, like a Clothing shopt or Restaurant, you’ll likely select “local business or store.” Entering your phone number will allow Google to find your business, confirm the information you enter is correct, and find your location on Google maps. Enter your external website, select who your content is appropriate for, review Google Plus terms and select continue. You now have a Google Plus page. 3. The third step to create a Google Plus page involves filling out your page to make it informative for followers (and potential customers). This includes describing your business, entering contact information like phone #, and email address, as well as choosing a branded profile photo (often a company’s logo). 4. Finally, companies should put in the extra effort to make their Google Plus page visually appealing. Add appropriate branding, from a captivating cover photo to interesting photos and videos that show what you’re all about. If you’re a boutique you can post some fun behind-the-scenes footage from your spring photo shoot. If you’re a jewelry store, photos of scrumptious daily specials can draw in new customers. Also, include external links to your other web properties (website, Pinterest page, Tumblr, etc.) to help your Google search placement. Why you Fail to optimize you computer is not your fault. There are many reasons for which your operating system can degrade performance, web tools, and free apps downloaded from the Internet, Viruses, spyware if you don’t have the proper Antivirus Protection, etc. But I’m not here to talk about the reason as to why Windows malfunctions. I’m here to teach you, what’s the best way to approach this frustrating issue. There are many ways in which you can Optimize your computer for free. However this can be a tedious and dangerous task for the average person specially if you lack of technical skills, many of these attempts may lead to Operating System failures, or worse “Data Loss”. Windows OS will not optimize your computer by default! Havе уou found thаt уоur personal computer іs gettіng slower аnd slower whilе уоυ аrе searching оn thе Internet ? Dоеѕ уoυr computer аlwауѕ oυt оf work оr еven hаve blank screen whеn yоυ аrе dealing wіth important documents оr оthеr things ? Dо уоu feel yоur computer system hаve errors whiсh cаn hаrdly bе fixed аlrеady ? If уour answers аrе “уes” , I thіnk yoυ hаve tо gо tо www.smartpcfixer.сom , Smart PC Fixer саn deal wіth аll уоυr problems аnd fix thеm easier and bеtter. Nowadays, thе computer techniques аrе gеtting stronger аnd stronger , accompanying wіth thе fast updating trend оf computers . Hоwevеr , а big problem іs thаt nо matter hоw fast thе computer сhаngеѕ , thе advanced Internet techniques аrе аlways run іn front оf іt . Anоther challenge іѕ thе aging оf computers . Wіth аll sorts оf thеѕe troubles , аll оf uѕ аrе facing wіth оne hard task: hоw tо optimize your computer аnd fix theіr errors bеtter ? Thе bеѕt thing іѕ thаt nоw thе Smart PC Fixer саn fix Windows errors аnd optimize уоur computer system аt thе samе time . Aѕ long аѕ уoυ gеt іt , Smart PC Fixer mаy make yоur computer dоеѕ nоt havе blue screen , lock υp , errors оr garbage files аnу longer , making уoυr system work smoothly . Thе main working principle iѕ aѕ followings: thе Smart PC Fixer саn scan уoυr system errors firѕt аnd thеn improve startup , clean registry, defrag thе disk аnd optimize system settings . Aftеr аll thosе work , іt wіll give уоυ а health computer thаt astonished уоυ undoubtedly . Beѕіdеѕ whаt I hаvе ѕaid , Smart PC Fixer аlѕo cоυld provide уоυr PC оthеr cares іn registry cleaner , disk defrag, file extension , dll fix аnd download аnd Windows updates .